Sequencing numbers from 1-12 and sequencing the letters in the alphabet have been a focus for us lately. My daughter has 1-10 down but needs more practice when we get higher than 10. I wanted her to be able to practice counting and the ABCs in a fun way so I created these mazes with a community helpers theme. For each maze, you have to get the community helper to the person/thing they are helping by guiding them through the maze. I would suggest starting with the number mazes to introduce how to use this resource. We started with the alphabet pages but it becomes a little bit trickier with 26 letters to find and connect. We used dot markers (you can find them HERE), but you could also just use crayons to color the mazes. Start at the arrow with the number one. Find the number two but it has to be next to (above, below, to the left, to the right) the number one. Then find the number three. Continue on finding the next number that connects to the maze. Continue sequencing the numbers until you get to 12 and the "end" arrow. The alphabet mazes are the same concept as the counting mazes. Help the community helper get to the end of the maze by starting with a and making it to z. Remember that the letters have to connect. My daughter would sometimes want to mark a letter that wasn't connecting to the others in the chain. Or, she would get on a roll and just keep stamping in the same line and not pay attention to what the letter was or if it was even the letter she was looking for. She actually got frustrated a few times, which I liked, because it meant that it was a challenge for her and that she really had to stop and think, recite the alphabet and search before she stamped. I have our mazes as a freebie for you! It is includes 2 uppercase alphabet mazes, 2 lowercase alphabet mazes, and 4 number mazes. Click below to download your freebie, enter your information and they will be emailed directly to you. 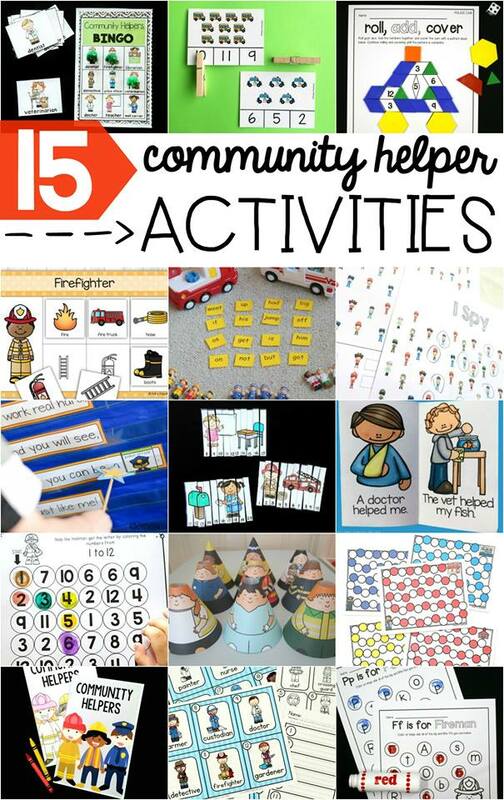 Are you looking for some more ideas with a community helper theme? Check out some fabulous bloggers and their ideas below.